Within the European Union, a profound awakening of public consciousness is taking place as organizers seek to obtain one million signatures on a petition in favor of a basic income guarantee for all citizens. Under the EU constitution, this number of signatures is required for the proposal to undergo formal study and debate by the European parliament. 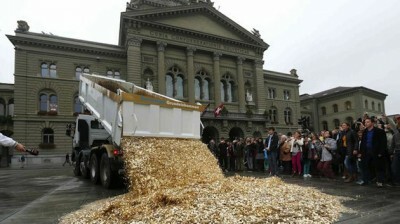 In Switzerland, however, voters have seized the initiative through their own petition to have the Swiss government vote on a basic income guarantee of $2,500 Swiss francs per month, equivalent to $2,800 U.S. dollars. A basic income guarantee is the only economic measure sufficient to resolve the growing worldwide discrepancy of income between those who have and those who don’t. The fact is that the tremendous productivity of modern industry should mean that fewer people should have to work to produce the goods and services everyone needs to survive and even prosper. This is the fabled “leisure dividend” that economists promised long ago as the potential of modern industrial methods but that no nation on earth has ever delivered. The reason is that the fruits of the productivity miracle have been stolen by the kingpins of high finance who assure that all profits eventually flow into their own hands rather than the world’s populace. A basic income guarantee would assure that everyone gets their fair share of a nation’s output by right of birth, as members of the human family. People could then use the stipend as a supplement to their usual income or to study, do volunteer work, start their own business, or just retire early. The grinches of the world claim, of course, that the only effect would be to encourage laziness and bad habits like drunkenness or drug abuse, but the advocates of a basic income have a much more positive view of human nature than that. The grinches also claim that nations are too broke for such largess, ignoring the fact that they are broke because they have mortgaged their budgets through borrowing from the private banking system instead of exercising their own sovereign power of money-creation. Not to mention the huge amount of money wasted worldwide on military spending which is mainly intended to protect the property of rich people and rich nations.